As we've previously done with Twitter and LendingClub, we've dug through the numbers to bring you Box's (shaky) path to IPO. 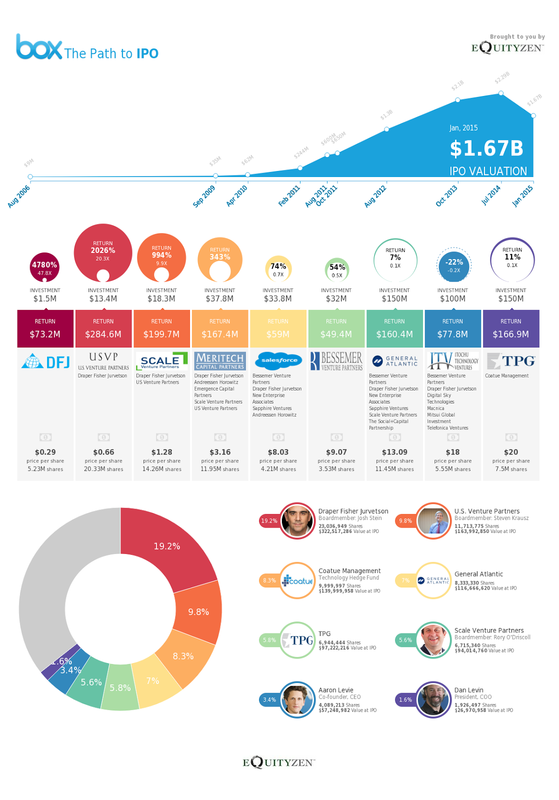 Below, you'll find our breakdown of how the venture investors have done, as well as key executives (ahem, Aaron Levie) and directors. Better late than never: Box took quite the meandering path to get here, but it has finally reached the public markets. Having originally filed its IPO registration document in March 2014, it has gone public 10 months later. Discount to last round: Box's IPO price of $14 per share is a substantial discount to the $20 per share hedge fund Coatue Mangement and private equity fund TPG paid in their July 2014 investment. Ratchet: To be sure, Coatue and TPG are making money here. Each invested $75 million in the July 2014 round, which, based on the conversion ratio stipulated in that investment, now has a notional value of $83,475,000 at the IPO price of $14. Poison pill: Had Box not gone public within a year of its July 2014 fundraise, led by Coatue Mangement and TPG, it would have had to pay a $0.75 per share penalty for each quarter the IPO was further delayed. Burn, baby, burn: Box burned $120.8 million in the nine months ending October 31, 2014, leaving it with just $165 million, or approximately 12 months of runway from that time.